A contemporary system for internal doors. All the hardware is manufactured from stainless steel (grade 304) with a superb satin finish. Recommended lock GL34S. 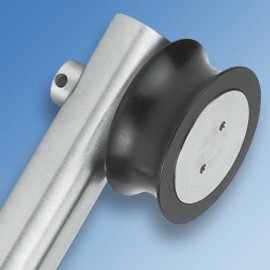 Note: The roller hangers and also bracket GSD151C are available for either countersunk or standard holes in the glass. Please contact our sales office for more information.